Paella is a common dish in Spanish cuisine, often including seafood or meat. 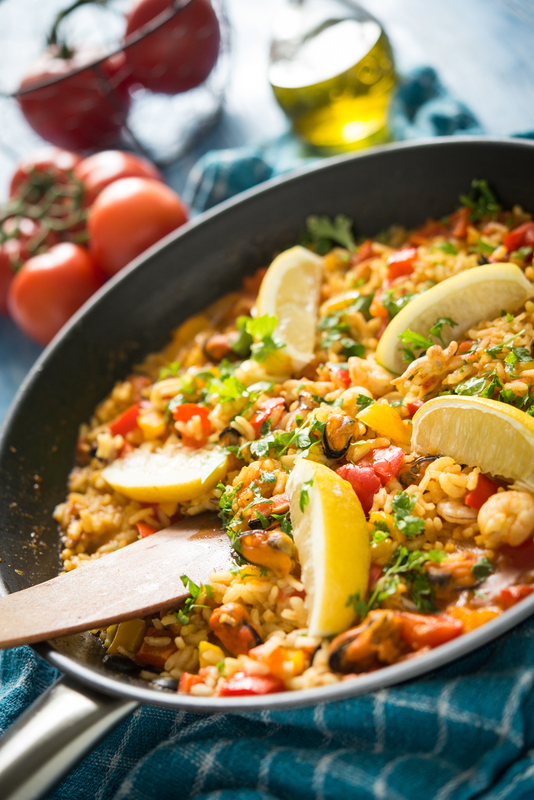 Paella is regularly regarded as the national dish of Spain, but most Spaniards consider it a regional dish hailing from Valencia. This version, filled with tender chicken and fragrant saffron, is perfect as a family meal. Heat the olive oil in a paella pan and sauté the chicken until golden, aprox 10’, pour the lima beans, and the tomatoes and sauté another 3’, add the paprika and the saffron and sauté them altogether another 2’. In the meanwhile, heat the broth in a separate saucepan until simmering. Stir in the peas and the artichokes and then reduce to medium another 12 minutes until almost tender and almost all the liquid has been absorbed. Leave the rice stand 5 minutes before eating.